Bay Park Press: "Jim Machacek has been creating artworks in printmaking, artist books, drawing and mixed media for three decades. ... He has lived in San Diego since 1984 and is currently teaching in the art department at San Diego Mesa College where he co-founded Mesa Arts Press to promote the art of fine printing in the production of artists’ books, prints, and ephemera. ... Jim is also co–founder and master printer at Bay Park Press, a San Diego fine art press and collaborative print studio." San Diego, California: 2013, Bay Park Press. Edition of 18. 9 x 11.75"; 86 leaves including contents page, author and narrator introduction, ancestry chart, and maps. Digital and letterpress printing. Printed on Fabriano Rosapina Blanco paper with deckled bottom edges. Includes a signed and numbered etching, two printed collages, and a souvenir book mark. Housed in a leatherette clamshell box lined with French marbled paper and silk book cloth. An etched K on copper plate attached to the front cover. Signed and numbered on the colophon by the artist. Jim Machacek: "The Kincade Chronicles follows a family from Scotland to America, is set in Tidewater VA and covers about three centuries of their life from Colonial era to modern day. Each of the eight chapters is a different generation. It's fiction, but uses 'selected' historical facts: a few wars, slavery, aids, etc. Most characters are fictional but their names come from both sides of my family history and from friends... and some have the spirit of my relatives. Chapters 7 and 8 are 'somewhat' auto biographical. The story is narrated by 'Mitchell Kincade,' the star of Chapter 8, with a short intro before each chapter. But characters in all chapters speak in their own voice during dialogue." San Diego, California: Bay Park Press, 2007. Edition of 10. 15 x 10.25"; 8 pages. 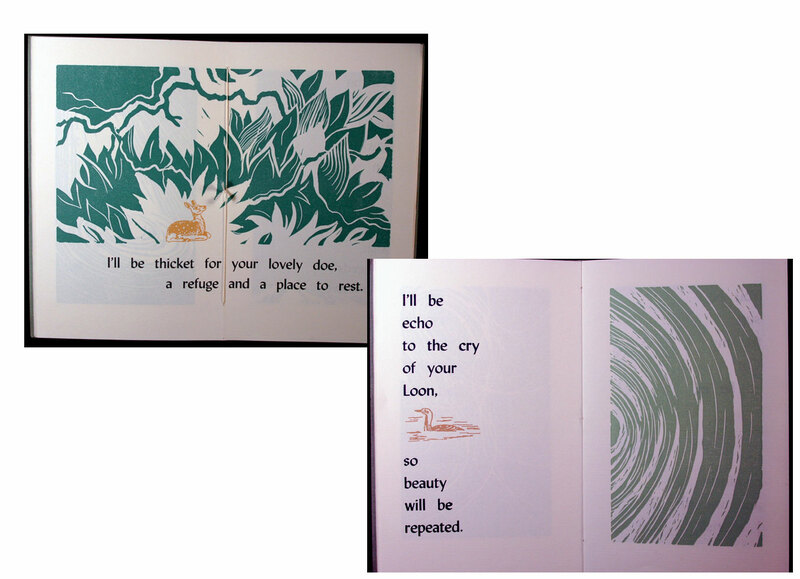 The poem is set in 24 point Bernhard Modern and printed on Fabriano Rosapina. Housed in a closed lightweight fold with elastic closure. Designed and printed by Jim Machacek. Colophon: "This poem was handed in to a high school teacher in Regina, Saskatchewan, by a senior year student. A few weeks later he committed suicide. The poem originally appeared in Generation Magazine in Canada and [was] reprinted in Nola Express. It was given to the artist many years ago and has haunted him ever since. As a long time art teacher, it has cemented his conviction that we need to let creativity bloom and nurture it." San Diego: Bay Park Press, 2007. One-of-a-Kind. 4 x 4" hinged wooden box containing two items: 3" square 6-page accordion pamphlet; 3.5" square 70 page accordion fold book. Letterpress printed. Hand-painted pages. Bay Park Press: "And so began Jim Machacek’s music box series of artist books where he selects favorite musical works and makes them visual. Pages are hand-painted in hues of blue, silver, and hints of violet, and hinged with silvery paper moons into an accordion structure. "The color and pattern of pages change as you progress through the three sonata movements. Each page is letterpress printed on the verso with Beethoven’s score. The pages rise up out of wooden box stained cobalt blue and can be floated 10 ft in the air by attached sterling silver rings. In the bottom of the box you find the polymer plate used to print the score, painted silver. "Also included is a small accordion structure letterpress printed with images and facts about Beethoven and the sonata." San Diego: Bay Park Press, 2005. One-of-a-Kind. 9.5 x 3 x 1.5"; extends to 90". 30 pages. Vertical accordion structure with machine stitching binding the pages. 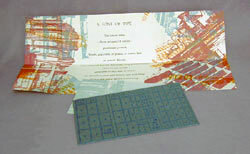 Letterpress, relief, and transfer printing on Velata paper. Hand painting and collage intaglio. Housed in a 10.25 x 4.1 x 2.25" stained and lidded wooden box. Jim Machacek: "I like mystery, secret codes, and the color red." Bay Park Press: "You will find these elements and more in Machacek's Code Book Series, begun in 1993 and so far numbering seventeen. This book was inspired by the No drama masks collected and preserved in Japan by the ruling Tokugawa family from 1607 to 1871. 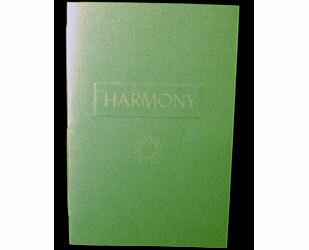 Pages are relief printed front and back with special 'code' plates and hinged into an accordion structure with machine stitching. 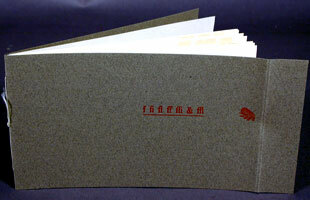 Pages are coded with intaglio collage, transfer printing, and hand-painted Japanese characters. Title and colophon pages are letterpress printed. The book is housed in a wooden box stained black on the outside and deep red on the inside. It can unfold on a table surface but was intended to rise 90" vertically out of box and hang from attached brass rings." An Interpretation Walt Whitman's "A Font of Type." The ten lines of Whitman's ode to type: "This latent mine – these unlaunch'd voices – " explode as a printed collage of type cases and press objects and furniture. A beige, backdrop grid is the California job case. Red, pale blue, and yellow inked collage. A poem that recognizes the potential power of the voice contained in a font of type, "within pallid slivers slumbering" unleashed through print. A wonderful tribute to the noble vocation of printing. 8 x 4" Letterpress on Superfine. Pamphlet stitched landscape into self-enclosing tabbed wrapper. Billed as first fanciful publication reflecting our acquisition of two cases of wood display ligatures and 18 point Century Schoolbook. This is a type lovers delight. Quoting a character in their story, one might say to the authors, "You're afflicted with ligatures!" The ligature-laden publishers contrived a text full of ligatures (that is: f-ligature words). They also reveal a fondness for f -alliteration. Playful proliferating wood type ligatures parade across the page (perhaps alliteration is contagious). Ampersands, f-ornaments (ornaments of objects whose names begin with f, and figures of fig leaves and Fiji fill out their offering. San Diego, California: Mesa Arts Press, 1994. Edition of 50. 5.5 x 8.5"; 24 unnumbered pages. Set in 30 pt Lydian. Papers: Howard Linen text (Birch), Classic Linen cover (Augusta green) and a Skytone Pewter text. Pamphlet bound. California: Mesa Arts Press, 1994. Edition of 50. 4 x 3"; 14 unnumbered pages. Single sheet forming the 14 pages. Accordion structure. Letterpress printed. 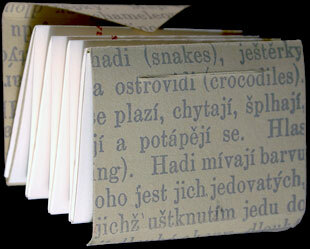 Bound with illustrated alphabetic paper wraps with slip in closures at each end. Each printer was to use all of the twenty-six letters of the alphabet in a short sentence. One side is handset and printed by Genie Shenk in 18 pt Gill Sans. 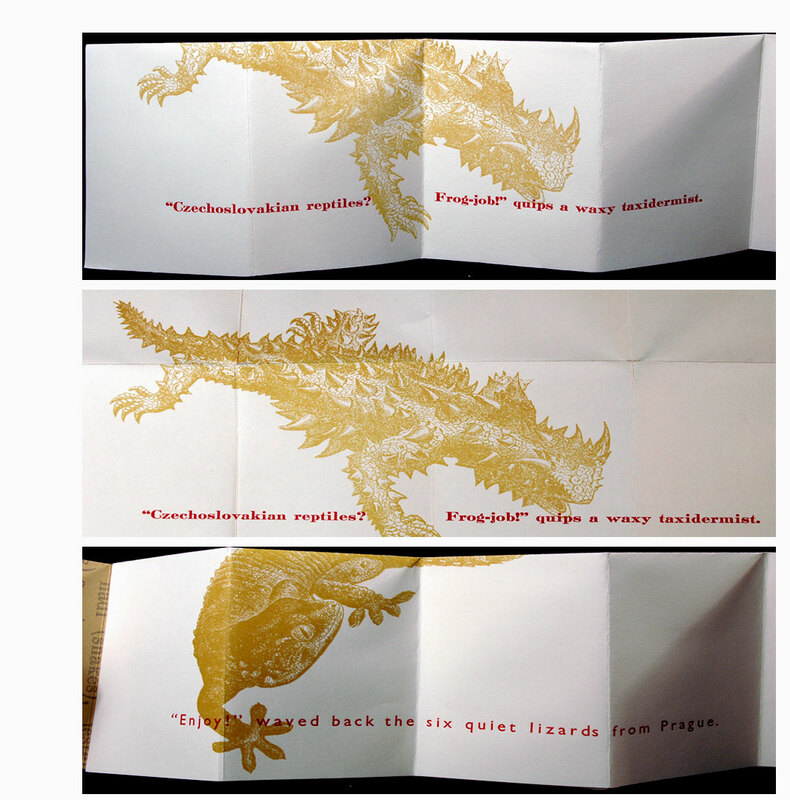 The other side is handset and printed by Jim Machacek in 14pt Litho Roman. One of the sentences has a missing letter. Ah, which letter, which sentence?